Retail concept for a high quality shirt brand in China. Design and realisation is done in collaboration with Three dogs Retail Design. 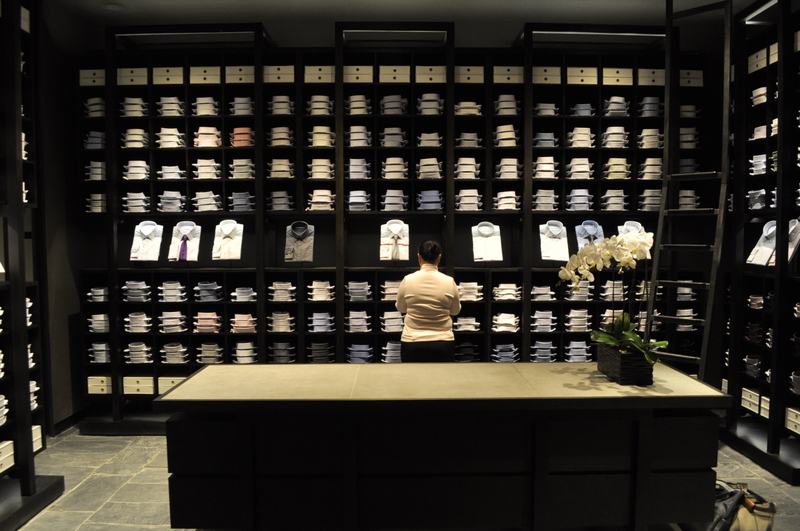 Pye is a Chinese brand that specializes in upper market dress shirts. The target customers are self-aware and quality conscious men and women. For Pye Gout Mao in Beijing we were asked to develop a concept for the store that we could easily translate to different locations. Key question was how to sell a white shirt? 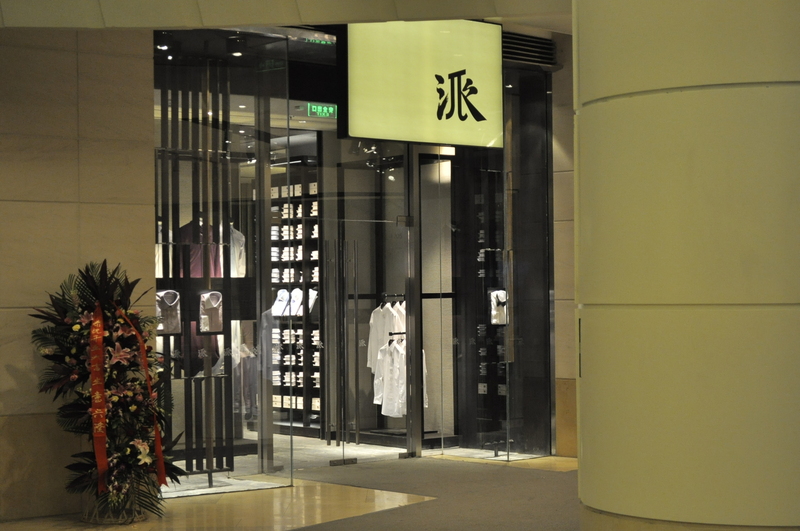 And what does a contemporary Chinese store look like? The Mother company Esquel owns the whole chain from farming the cotton, making the yarns, the fabrics and the tailoring. This gives Pye the edge to use the best fabrics and have a large stock. 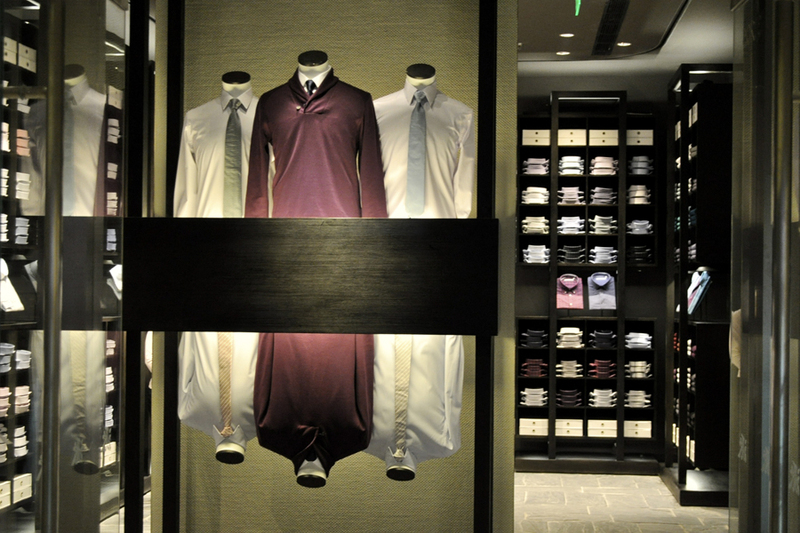 The idea that any person in any size should be able to find a fitting dress shirt in the shop is therefore realistic. As a reference for the shop concept we used a library. We wanted the customer to have the same overwhelming feeling of abundance as when you walk into a city library. The library was a good reference, because it has certain richness, without being loud. It has culture, and breathes intelligence. So instead of creating a big open shop, we divided the space in 4 intimate areas: men’s shirt library, women’s section, lounge section with the register and the fitting room area. The intimacy creates a feeling of quality, and it gives you the opportunity to use the expertise of the staff the help you advise on your needs. 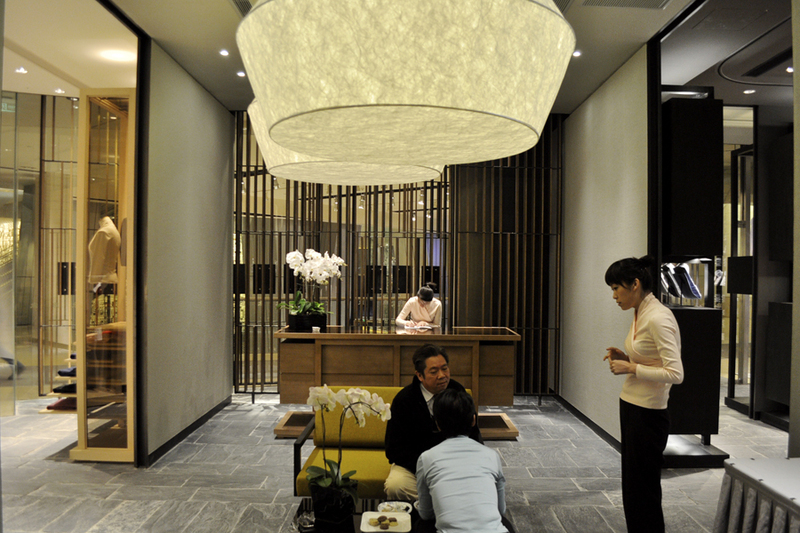 We tried not to design the fixtures as rich elements, but we use materials and textures to create a tempered luxury. Our layout makes a reference to a Chinese house with its open connections between the spaces and the reference to the Chinese dividers in the men’s entrance. This covered the general design intention regarding the shop identity. But on a product level we still needed to design a way to present the shirts. Especially how do you show you communicate that you sell shirts and only shirts? 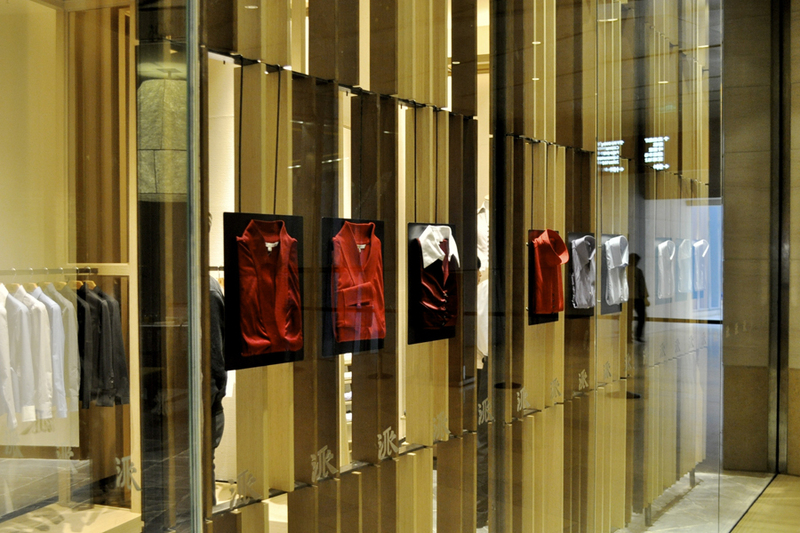 (As many shirt shops also show pants on a mannequin, and then get the problem that clients want to buy the pants, not the shirt…) So we created two installations. In the window shop, we fold shirts to this crisp beautiful package like when you get a new shirt out of a box. And we present it the way jewellery stores present their jewels. By not trying to show the shirts on a mannequin, we actually lifted the value of the shirt. The other installation we made was on the men’s mannequins. We made an installation that said everything about the shirt, and nothing else. We showed the torso mannequins with a shirt, and instead of showing pants, we mirrored the installation upside down. The result is an intriguing image, where people stop and look twice to understand what they see.